this simply should not be and yet it is. 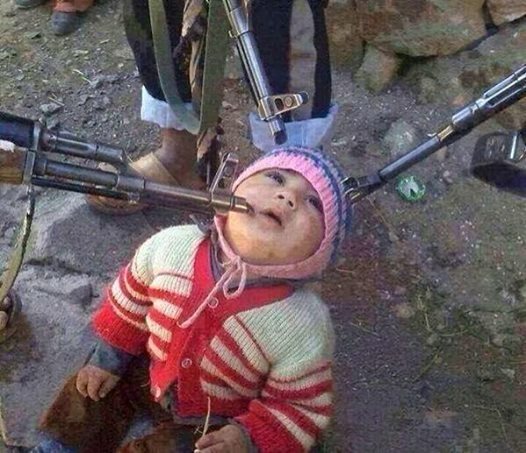 here’s the story if you have not already heard: ISIS beheading children in Iraq. no human could systematically do this to children without experiencing trauma oneself. it is evil, pure and simple. the answer? follow Christ’s example (see Matthew 4) and combat evil with the Word of God. please join me and conscious people throughout the word in the prayer that will combat this evil. Leviticus 18:1 “‘Do not give any of your children to be sacrificed to Molek, for you must not profane the name of your God. I am the Lord. Deuteronomy 4:9 Only be careful, and watch yourselves closely so that you do not forget the things your eyes have seen or let them fade from your heart as long as you live. Teach them to your children and to their children after them. Deuteronomy 4:40 Keep his decrees and commands, which I am giving you today, so that it may go well with you and your children after you and that you may live long in the land the Lord your God gives you for all time. (Given before the grace of Jesus Christ at Calvary). Deuteronomy 14:1 You are the children of the Lord your God. Psalm 72:4 May he defend the afflicted among the people and save the children of the needy; may he crush the oppressor. Psalm 127:4 Like arrows in the hands of a warrior are children born in one’s youth. Lamentations 4:2 How the precious children of Zion, once worth their weight in gold, are now considered as pots of clay, the work of a potter’s hands! Micah 1:16 Shave your head in mourning for the children in whom you delight; make yourself as bald as the vulture, for they will go from you into exile. Mark 10:16 And he took the children in his arms, placed his hands on them and blessed them. Luke 23:28 Jesus turned and said to them, “Daughters of Jerusalem, do not weep for me; weep for yourselves and for your children. Romans 9:8 In other words, it is not the children by physical descent who are God’s children, but it is the children of the promise who are regarded as Abraham’s offspring. Revelation 21:7 Those who are victorious will inherit all this, and I will be their God and they will be my children. Banded together through the Word of The Lord God Almighty we stand firm in prayer for those who do not know Him and for those who know Him and whom love Him and are persecuted because of their faith in Him. May He be glorified in the faithfulness of His flock. I had not heard the news and am saddened to to hear of these atrocities. Thank you Julie for bringing it to the attention of those like me that had not heard.